ConTe, part of the UK’s Admiral auto-insurance group, provides affordable insurance and premium customer service. Some 300 in-house, trained specialists are ready to give expert advice and support to its clients. The rapid growth of ConTe has made consistently giving its best more challenging, as often is the case with expanding enterprises. Thanks to the technology investments that optimised the customer service operation, ConTe is able to continue offering a most affordable price on the market. 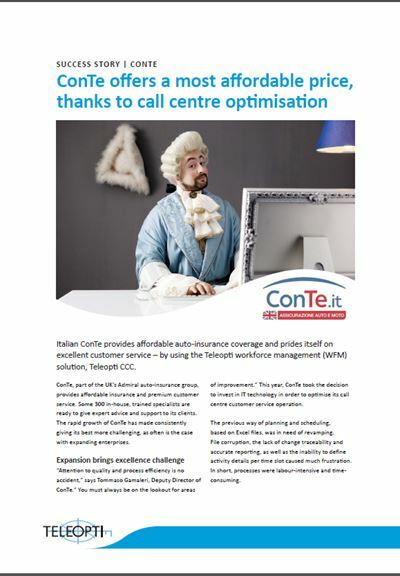 Check how ConTe changed a previously labour-intensive and time-consuming process with the help of Teleopti WFM.